Top notes feature starfruit nectar, waterfall and white pineapple. In the middle are wild amazon jasmine and sugared orchid. 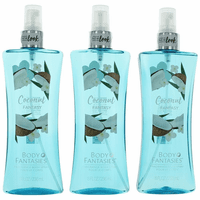 Rounding things out are the richest scents of sweet musk, teak and two coconut scents-coconut palm and cream of coconut.